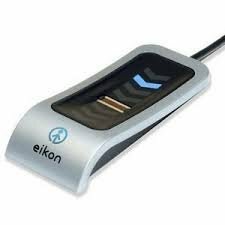 The Eikon USB fingerprint reader enables fast and convenient Windows login by remembering your Windows password for you. This fingerprint reader originally manufactured by UPEK contains the same award winning technology used by HP, Dell, Lenovo and other top-tier laptop manufacturers. The reader is designed for ease of use for stationary work environments with a smooth finger guide surface and an extra long USB cable. This reader contains a non-skid back surface material so that reader remains firmly in place during the finger slide. The Eikon fingerprint reader works with the NEW Microsoft Windows 10 and Windows 8.1 with no additional software to install! This reader is truly the most secure and most convenient way to protect access to your desktop or laptop computer. NOTE: The SKU is the for the fingerprint reader only. The software to enable this sensor to work with Windows Login is included in Windows 10 and Windows 8.1.